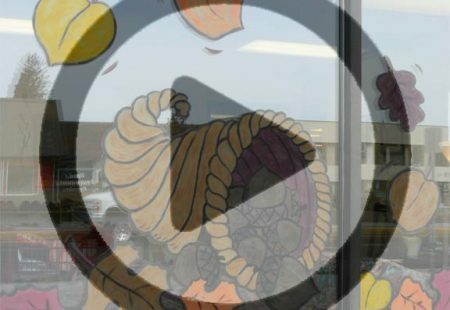 Glass painting on store windows can be a great way to make a lot of money over the holidays, but figuring out how to do it right is not as easy as you think. 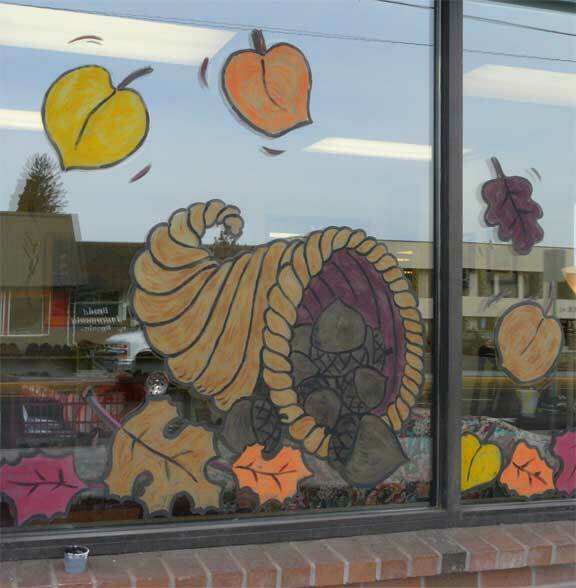 I’ve done holiday-themed window paintings before, but I’ve always used acrylic paints. However, though acrylic looks good, it’s a pain to take off the window because you have to scrape the whole thing off with a razor blade. I could never figure out how to use tempera paints like the pros do, but this year I was determined to learn. After researching and trying different techniques, here is what I learned about window painting with tempera paints. DO NOT PAINT ON THE INSIDE of the window unless you live in a very rainy climate. Painting on the inside means the reflection on the outer side of the glass will hide your painting for the most part. DO NOT USE the tempera paints that are PRE-MIXED for school use unless you also have powdered tempera to thicken it with. DO NOT USE OLD PAINT. Let me tell you what happened when I used old paint. Soon after painting a fall scene complete with cornucopia and falling leaves, all the colored paints that had a bit of yellow in it (the yellow was old) began to flake off. Within hours, the inside of the store I was painting it for looked like a real fall scene. There were flakes of yellows, oranges, and green all over the floor. The only color that stayed was black and pure red. Anything that had yellow mixed in, flaked off. I’m glad the black outline stayed because I used it as my template when I re-painted the window from the outside today. USE POWDERED TEMPERA mixed with very little water, ADD DISH SOAP to your paints to make them stick, and ADD A LITTLE BIT OF WHITE to all your colors (except the black outline) to make them visible. I would change the color of the acorns in my painting above to make them lighter (but since it’s almost time to change the theme of the window painting, I’m letting it stand). All dark paints disappear into the dark background of the store. 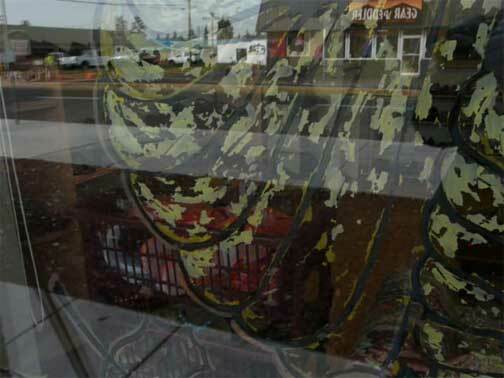 Now, get thee to the streets and make thee some money this holiday doing window painting! Marta – I tried painting a window this week and had a problem with the paint sticking. It went on nicely but halfway through it just started to disappear in places. I used pre-mixed tempera paint mixed with powdered tempera to thicken and clear Dawn dish soap. The pre-mixed paint does seem “glossy” and slick. Should I just try the powdered tempera, water and dish soap? Thanks so much for the post and your assistance! Hey there. Thanks for the post. I just wanted to see if you or anyone have any insite on condensation. I did a huge piece at a restaurant with varying temperatures, painted from the inside, only white acrylic, and two days later half of the piece had slid down. Tragic, but then the rest seems to have stayed put. Would love to chat about it to fix future problems ! Wow, that is weird, but it would be good to get to the bottom of this. Did you clean the glass before painting it? What did you use as paint? I decided after my first failed attempt at painting a window on the inside to stick to the outside instead. The mixture of tempera with a bit of dish soap seems to do the trick of keeping it glued to the window. Let us know the details of your work so we can brainstorm, ok?